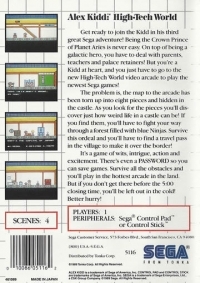 Box Text: Get ready to join the Kidd in his third great Sega adventure! Being the Crown Prince of Planet Aries is never easy. On top of being a galactic hero, you have to deal with parents, teachers and palace retainers! But you're a Kidd at heart, and you just have to go to the new High-Tech World video arcade to play the newest Sega games. The problem is, the map to the arcade has been torn up into 8 pieces and hidden in the castle. As you look for the pieces you'll discover just how weird life in a castle can be! If you find them, you'll have to fight your way through a forest filled with blue Ninjas. Survive this ordeal and you'll have to find a travel pass in the village to make it over the border! It's a game of wits, intrigue, action and excitement. There's even a PASSWORD so you can save games. Survive all the obstacles and you'll play in the hottest arcade in the land. But if you don't get there before 5:00 closing time, you'll be left out in the cold! Better hurry! 09-12-2017 tripredacus Box Text Get ready to join the Kidd in his third great Sega adventure! Being the Crown Prince of Planet Aries is never easy. On top of being a galactic hero, you have to deal with parents, teachers and palace retainers! But you're a Kidd at heart, and you just have to go to the new High-Tech World video arcade to play the newest Sega games. The problem is, the map to the arcade has been torn up into 8 pieces and hidden in the castle. As you look for the pieces you'll discover just how weird life in a castle can be! If you find them, you'll have to fight your way through a forest filled with blue Ninjas. Survive this ordeal and you'll have to find a travel pass in the village to make it over the border! It's a game of wits, intrigue, action and excitement. There's even a PASSWORD so you can save games. Survive all the obstacles and you'll play in the hottest arcade in the land. But if you don't get there before 5:00 closing time, you'll be left out in the cold! Better hurry! This is a list of VGCollect users who have Alex Kidd: High-Tech World in their Collection. This is a list of VGCollect users who have Alex Kidd: High-Tech World in their Sell List. 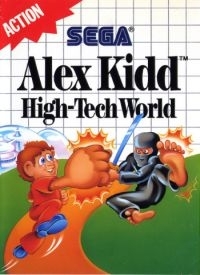 This is a list of VGCollect users who have Alex Kidd: High-Tech World in their Wish List.